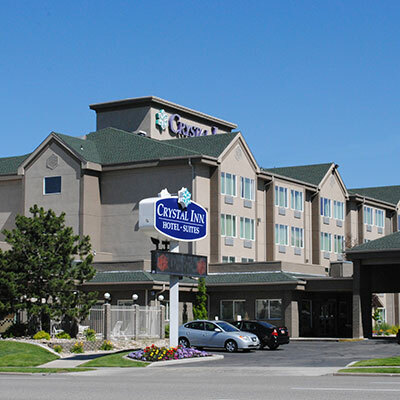 Crystal Inn Hotel & Suites in downtown Salt Lake City is delighted to welcome RootsTech attendees. Our oversized guest rooms come with your choice of a king bed or two queen beds with a separate seating area and workstation. Features and services include a free hot breakfast buffet, a free airport shuttle, a free Family History Library shuttle, free Wi-Fi, an indoor swimming pool, and a hot tub and fitness center. 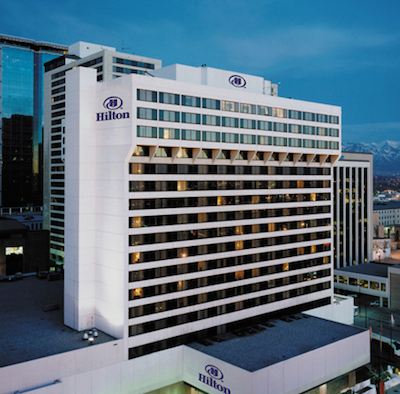 Conveniently located in the entertainment district of Salt Lake City and adjacent to the Salt Palace Convention Center, the Hilton Salt Lake City Center has a great range of guest rooms and suites, all offering high-speed internet access and panoramic views across the stunning Salt Lake Valley. This Salt Lake City hotel is conveniently located on the Salt Lake City light rail system. Rates will be honored for reservation dates from February 25 to March 4. Reservations must be made by February 4, 2019. Call 1-801-328-2000. Tell the reservation agent you are a RootsTech attendee, and ask for the conference pricing. 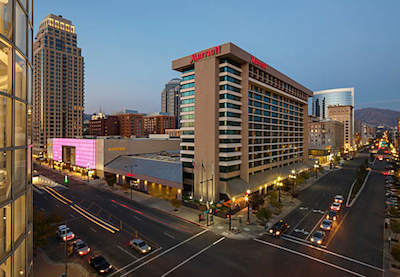 The Salt Lake City Marriott, located in downtown, is adjacent to City Creek, Salt Lake City’s premier shopping, dining, and entertainment district. Guest rooms offer a dynamic mix of high-tech and high style, while the restaurant Elevations takes a cue from the surrounding mountains, with a casual alpine ambience. Rates will be honored for reservations dates from February 27 to March 4. Reservations must be made by February 4, 2019. Book online or call 1-801-531-0800. Tell the reservation agent that you are a RootsTech attendee, and ask for conference pricing. 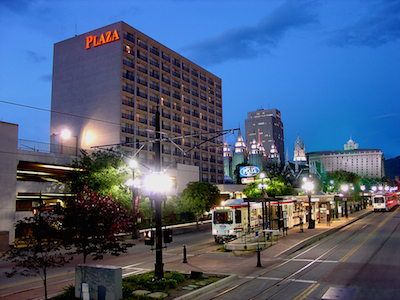 The Salt Lake Plaza Hotel at Temple Square conveniently places you in downtown Salt Lake City, across the street from historic Temple Square and the Salt Palace Convention Center. Next door to the world-renowned Family History Library, the hotel’s amenities are perfectly appointed to meet the expectations of today’s family historian and include microwaves and refrigerators in every room, complimentary high-speed internet, complimentary airport shuttle, and on-site restaurant. Rates will be honored for reservation dates from February 24 to March 3 Reservations must be made by December 15, 2018. Call 1-801-521-0130. Tell the reservation agent that you are a RootsTech attendee, and ask for the conference pricing. 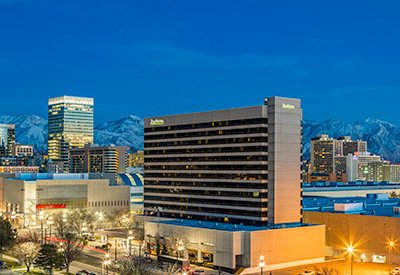 The recently refurbished Radisson Salt Lake City Hotel is the closest hotel to the Salt Palace Convention Center. This hotel is also conveniently located one block east of the light rail Arena TRAX station, making transportation to and from the SLC International Airport quick and efficient. This hotel is 100 percent nonsmoking. Rates will be honored for reservation dates from February 25 to March 3. Reservations must be made by February 5, 2019. Book online or call 1-800-333-3333. Tell the reservation agent that you are a RootsTech attendee, and ask for the conference pricing.